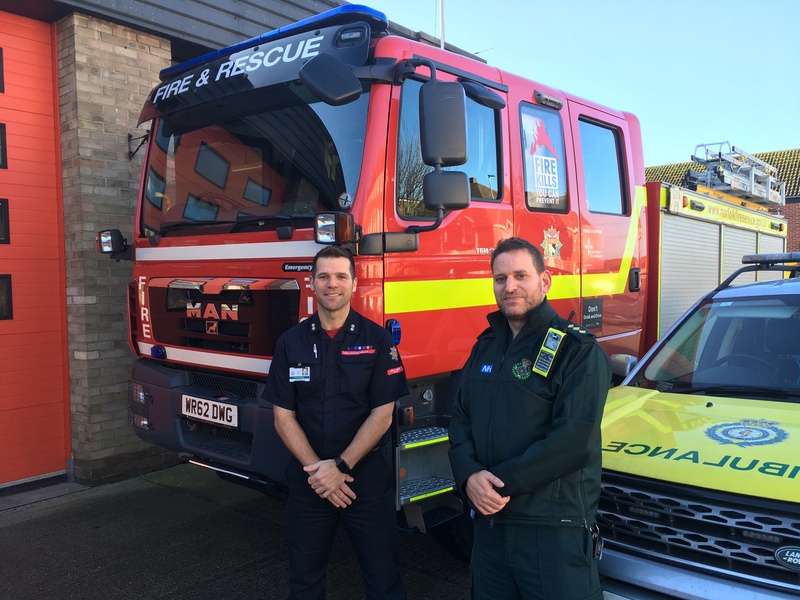 Watch Manager Thaine Hacon and EEAST Duty Locality Officer Mark Little at Great Yarmouth Fire Station. A new ambulance response post has opened in Great Yarmouth, Norfolk thanks to a partnership with the county’s fire and rescue service. Staff from the East of England Ambulance Service NHS Trust (EEAST) have begun responding from the Norfolk Fire and Rescue Service base in Friars Lane, Great Yarmouth. The ambulance service will have a rapid response vehicle permanently based at the fire station and a double staffed ambulance whenever possible to improve responses to patients in the Yarmouth area. Minor amendments have been made to the fire station to turn it into an ambulance response post. Mark Little, Duty Locality Officer for EEAST, said the response post was in addition to the trust’s ambulance hub in Gorleston. He said, “Staff have been very supportive of the move to the fire station as they can see the benefits of the location of the site and are looking forward to co-sharing with fire service colleagues. We have a very successful partnership with the fire service in sharing of facilities in other areas such as Lowestoft and Norwich.